Shweta Tripathi (aka Battatawada) and Chaitanya Sharma (aka SlowCheeta) are definitely the talk of the town owing to their ‘too-cute-to-handle’ instagram pictures. The lovey-dovey duo is all set to take their wedding vows in Goa tonight and I for one am too excited about it! Here’s the radiant bride-to-be flaunting her beautiful intricate mehendi design. Love the floral jewelry by Adirag. Some more pictures of the happy couple, who literally can’t contain their excitement. They sure are a match made in theatre heaven! 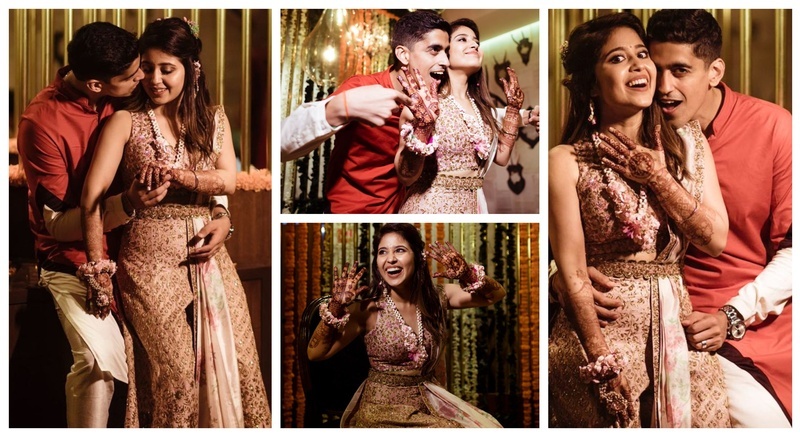 And just in case you missed it, here are some pictures of the couple from their wedding bash in Mumbai. The lovebirds couldn’t help smiling at each other and seemed to have the time of their life. With the pre-wedding festivities like this, we are eagerly awaiting their wedding pictures from tonight!